These are word files that will be sent to you in Zip Format via email. They are sent instantly after payment! Please make sure your email is correct when you order!!!! ONLY $7.99 for Word Files you Can Modify! This is two sheets. The first sheet is the graph. The graph includes pictures of jelly beans in color. You must supply your students with jellybeans. The second page is questions for your students to answer about their finished graph. A sorting sheet to use with jellybeans. This is three sheets. The first sheet is teacher directions. The second sheet is easy to draw graphics of a bunny, butterfly, and flowers. (The students may also keep this at their seats and cross out the parts as you work the lesson with the class.) 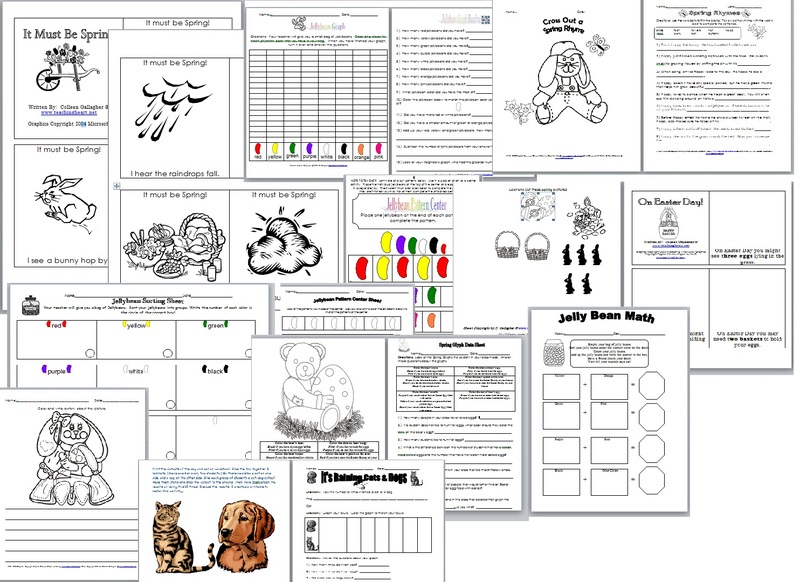 The third sheet is an independent activity for your students to complete after the lesson. All the materials you need to make this great center are included. All you have to do is laminate, cut, and display in a pocket chart. This also includes a center sheet for student to complete after they finish the center. Student colors pictures. The teacher and/or the student reads the text. The student glues the correct picture on the page. Student colors this very cute graphic of a baby bunny and his mommy. The student then write a sentence or story to match the picture. An easy to read book about the sights, sounds, and smells of spring. These print on 3 1/3" x 4"mailing labels/ AVERY 8164. Fill a Ziploc baggie with jellybeans or another Easter Treat. Place this label on the outside of the bag. Makes a great gift for friends, family, & students. Print the cutouts of the dog and cat on cardstock. Glue the two together & laminate. (Make one for every two students.) So there would be a cat on one side and a dog on the other side. Give each group of students a cat/dog cutout. Have them stand and drop the cutout to the ground. Then, have them graph the results of doing this 10 times. Discuss the results.